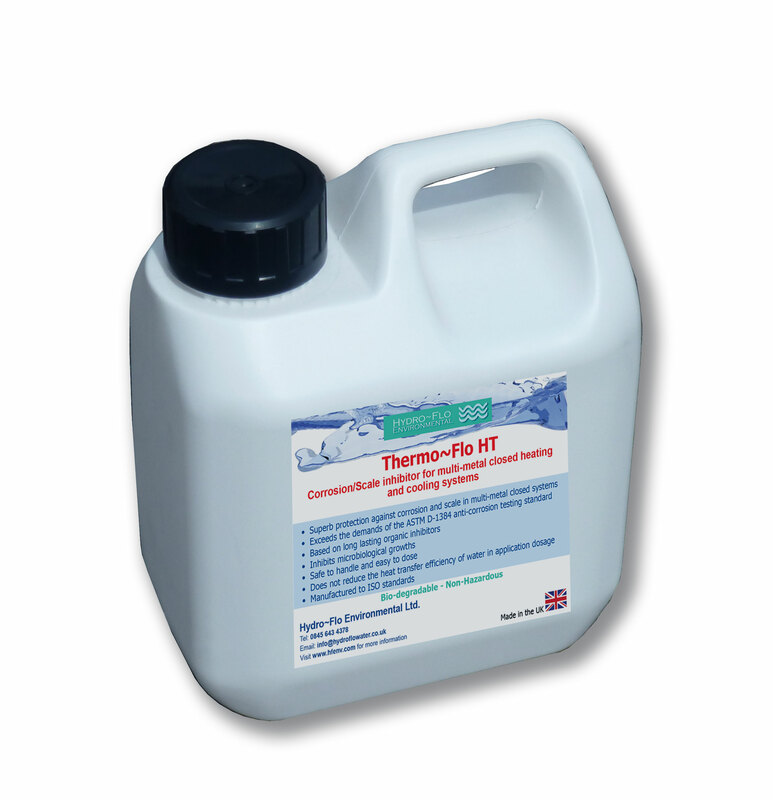 1.0 litre container of Thermo~Flo HT. Thermo~Flo HT is a pink coloured low dose corrosion and scale inhibitor designed for use in closed hot water and chilled water recirculating circuits. Thermo~Flo HT is a highly effective formulation which is biostable, totally water soluble and suitable for multi-metal systems i.e. ferrous and non-ferrous metals including those containing aluminium. Thermo~Flo HT is low foaming and does not contain sodium nitrite, silicone, mineral oil or phenols.Stable in strongly alkaline solutions Thermo~Flo HT maintains free movement in valves, threads and other immersed moving components and is not adversely affected by sodium hypochlorite. The dose rate of concentrated Thermo~Flo HT is between 0.5 and 2.0% v/v of the total water volume but is effective as low as 0.25% in well maintained and clean water systems. There are other variants of the product for highly specialised applications and for further information or assistance, please call the support team who will be happy to assist you further. We suggest that new systems (or older fouled systems) are pre-commission cleaned with B99 and B100 and then flushed through with fresh water before adding your Thermo~Flo HT. When filling the system with mains water you will usually find that in soft water areas corrosion will be the main problem – in hard water areas then scale will be the problem. Where very heavy scale is normal (heavy scale noted on kettle elements etc) then an extra small addition of B99 could be used to boost the anti-scale protection given by Thermo~Flo HT still further. Thermo~Flo reserves can be tested in-field or samples sent to Hydro~Flo Environmental for testing. See MSDS for further handling and safety measures. The salts contained in hard water tend to form a scale on the base or walls of vessels as well heat exchangers, pipes and nozzles, etc.Thermo~Flo HT is particularly effective against most types of scale rendering soft any particles precipitated or preventing formation altogether. After any required flush or pre-comm' clean mix Thermo~Flo HT into the water to be treated or add directly into recirculating system then let it recirculate thouroughly before testing.